NEW LOWER PRICE INCLUDES LOT PREMIUM AND SOME UPGRADES! 2nd FLOOR MOUNTAIN VIEWS! DRIVE TO 4343 S. FLANDERS STREET - SUNSET TERRACE AT QUINCY OVERLOOK TownHomes are high quality, modern and contemporary - built GREENSIDE. 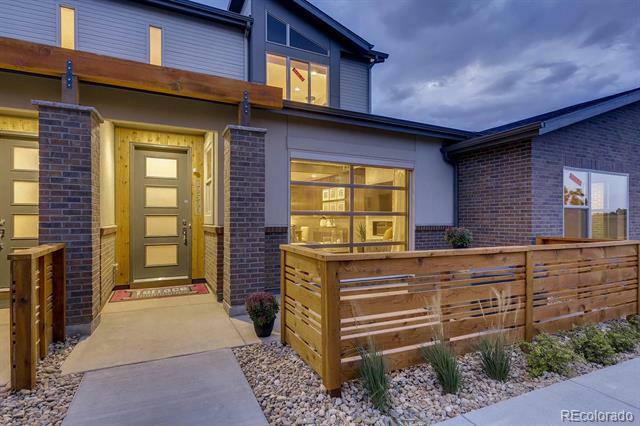 Ranch model has 2 sinks in the master bath, huge walk-in closet and Tech Room or Library. ALL models include a unique roll-up insulated, all glass, window garage inside the great room that opens to the spacious enclosed patios - LET THE OUTSIDE IN! Gourmet Kitchens with Granite and Standard Whirpool appliances including a built-in microwave. Granite in all bathrooms! Standard Thermatru entry door with 4 glass panels! Standard upgraded designer lighting package with LED bulbs, Standard exposed beam, Standard 2 car garage and Community Garden. Open House hours THURS thru MON, 12 Noon - 5 pm. CLOSED on TUES and WED.